What a wonderful week!! Spring has just started, and I am enjoying every single day of it. I enjoyed my week on Stardoll as well. In case you missed anything, or you just want to be reminded of the week, just keep reading. On Monday, we got new It Girls collection. Another ordinary collection..Items are mostly nice, I love colors, but honestly, nothing really caught my attention. I'll probably wait for a sale if I ever decide to buy from those clothes. Except for starcoin items. On Wednesday, boys on Stardoll got a little treat - 2 new floors of Mr. store. I like that Stardoll thinks of boys, and instead of releasing a 100th girl clothing collection, they decided to do something for male players. True, males are a minority on Stardoll, but still they deserve more. How about some limited items for guys? Like a whole limited collection dedicated to boys. I am wondering how fast it would sell out. One thing I am sure - there would be girls buying boy stuff. Some items can be worn by both male and female dolls. 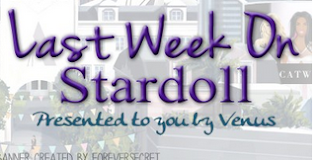 On Thursday, Stardoll announced a 60% off closing sale at Sprinkled store. Ok, I am not really sure about this. Granted, adding a nail design studio and nailpolishes and naildecorations wasn't the best idea from Stardoll, but I am wondering, what will members do when the store eventually leaves. Hand and nail decorations can't be sold in bazaar, so what about newer members - they will be only left with nailpolishes to decorate their virtual nails. But on the other hand, if Stardoll removes the polishes from plaza as well? I am clueless, really. And on Friday, we got new collection of Strike a Pose store. Honestly, I am not really impressed with the collection. There are only few nice poses, and most items that sold out first were non posed items. Not that I am complaining, I got some posed items, few more non posed ones. The flowers were a nice touch, but I think they would look nicer on a male doll, or a pal, you know, guy carrying flowers for a girl kind of thing. The collection hasn't sold out yet, so you still have time to get stuff you want, unless they, unfortunately, are sold out. That's it for now. A note to other writers and readers - I won't be home from tomorrow until Thursday, and I won't have internet access, so I won't be able to post news. Anyway, vote, comment, and I'll see you next week.